Miss Lola girl is already 11 pounds 8 ounces! This kid loves her bottle and will consume usually 4 ounces a feeding and sometimes more! I'm very meticulous about adding the correct amount in each bottle and storing it in the fridge for the day's feedings. Recently I have really been able to freeze a bunch of milk in preparation for my return back to work...in three months really. But the more I can freeze, the more I can keep her on breastmilk until her first birthday. However, about a month ago I started to get really concerned about my milk supply. I'd wait about four or five hours to pump and I'd only get about 5 ounces at a time. Now, some of you may freak about and say 5 ounces! That's a ton! Well, yes, it's a great amount. However, I normally can get about 9 or 10 ounces a pumping session so I knew something was up. But these sites also talked a lot about Fenugreek, a supplement that increases your overall milk supply. Now I'm not one that can always be taking pills let alone remember to take them for that matter! However I really wanted to give this Fenugreek a try - or at least find something conveninent that contained Fenugreek to see if it would actually help boost my milk supply. Then I remembered an episode of Tia and Tamera where the girls created a product called Milky! that was intended just for this reason. I knew I had to find out more about Milky! to see if it could help my milk situation out. Plus it was a product created and tested out by moms so I knew it had to be legit! Why does Milky! work you ask? As I was reading more information on Milky!, I learned that it was designed by a pediatrician and is made from organic herbs. The purpose of Milky! 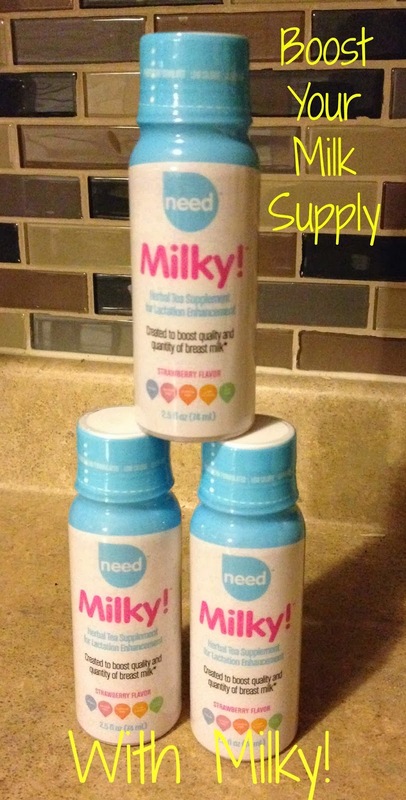 is to boost the overall quality of your breast milk supply as well as the amount you produce. It comes in convenient little bottles that you can throw into your purse or diaper bag so it's perfect for when you are on the go -- which most moms are anyways! This was definitely a product I wanted to try to help boost my milk for my little Lola. The recommended dosage of Milky! is two bottles a day - one in the morning and one in the afternoon. It has a strawberry flavor that is really pretty good and goes down quite smoothly. After one day of Milky! I totally noticed a difference in my milk supply. It gradually got back to where it was and now I'm able to maintain my supply again. This has been a huge relief because with my son I was able to pump for over six months. My goal with Lola is to pump at least through the summer so now I'm confident that I have the option of Milky! to boost my supply if it starts to get low again. I definitely am going to recommend Milky! to a few of my friends who are struggling with their own milk supplies. heck out the Rafflecopter below. Want to learn more about Milky! or order a supply for yourself? Milky! can also be purchased at Destination Maternity, A Pea in a Pod and Motherhood Maternity retailers. Disclosure: This product review was made possible by Milky! and Need Brands. All opinions are 100% mine. yes i have fenugreek seeds...i just soak them overnight in water...doesn't taste good but it does work and then i eat the seeds. thsi product sounds good! I wish I'd known about this stuff when my son was little! I tried everything – drops, cookies, everything I could find – and my supply was awful. Like, four ounces a DAY awful. I've made lactation cookies with oatmeal, flax seed meal and brewer's yeast and noticed a difference!